Combating Cult Mind Control was originally published in 1988, and is recognized as one of the best books on the topic. Hassan has just come out with a 25th anniversary edition, revised, updated and more relevant than ever. He includes a discussion of Islamic terrorists Hassan believes many jihadi organizations are political cults masquerading as religious movements. 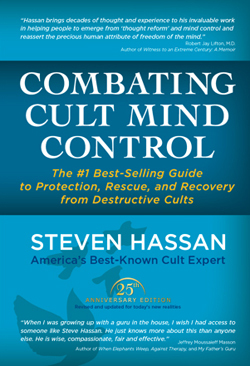 Another phenomenon that Hassan says has increased dramatically since his first book came out is the “mini-cult” groups of two to 12 people. Many romantic involvements with sociopaths could be viewed as a mini-cult. People involved with cults often undergo radical personality changes that is what Hassan means by the “false identity.” This also happens to people involved with a sociopath. I’ve heard from many family members of victims who say that they don’t recognize the person anymore. You may have felt this about yourself. 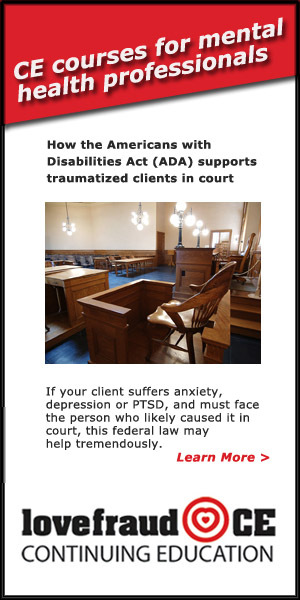 Behavioral control means regulating a person’s physical reality: where the victim lives, what they eat, what clothes they wear, what they can do, whether they can work, who they can talk to. This is exactly what many people involved with sociopaths have experienced. Information control means withholding facts or providing false information sociopaths are experts at this. The key strategy for cult (and sociopath) information control, Hassan says, is deception. Thought control means indoctrinating the victim to accept a cult’s teachings. 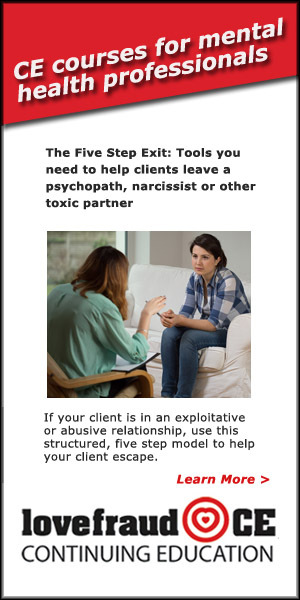 In the case of a sociopathic relationship, it could mean convincing the victim to accept and believe the sociopath’s story. 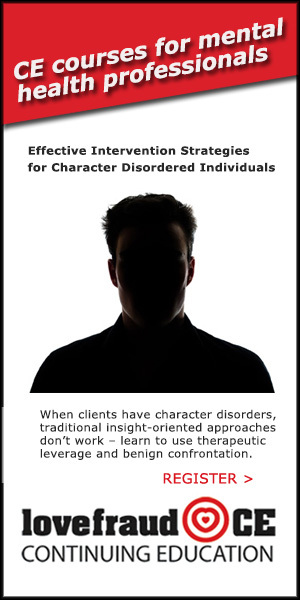 Emotional control means manipulating and narrowing the range of the victim’s feelings. This is usually accomplished through instilling fear and guilt, although the victim usually doesn’t realize that fear and built are being used to control them. The result? “This misuse of reward and punishment fosters dependency and helplessness,” Hassan says. A common misconception is that people who fall for cult leaders or con artists (essentially the same thing, in my opinion) are stupid or weak. We know that’s not the case many of the people I’ve spoken to who found themselves involved with sociopaths were educated and accomplished. Hassan points out that cults intentionally try to recruit educated, active and capable people. They look for talented professionals to manage their affairs and make them seem respectable. Sociopaths look for strong, caring individuals for exactly the same reason. Anyone, regardless of family background, can be recruited into a cult. The major variable is not the person’s family but the cult recruiter’s skill and the recruit’s life situation. The recruiter wants to draw as much information as possible from the potential convert, to determine the most effective way to bring them into the group. An effective recruiter knows how to home in on potential weak spots (called ”˜finding the ruin’ in Scientology). These may involve a boyfriend or girlfriend, parents, family members, job, or school; the death of a close friend or relative; a move to a new town, and any other significant transition or dislocation. An effective recruiter knows how to make the target comfortable, so more willing to disclose highly personal and confidential information. Meanwhile, the recruiter reveals as little as possible about themselves and (especially) the group, unless it is absolutely necessary. Most of the information comes from the person being recruited. This unbalanced flow of information is always a signal that something is wrong. 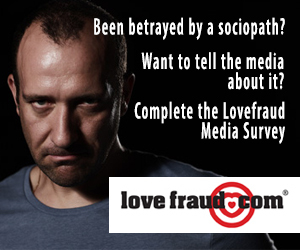 Sociopaths also find out as much as possible about their targets. They ask you questions and listen very carefully to your answers. 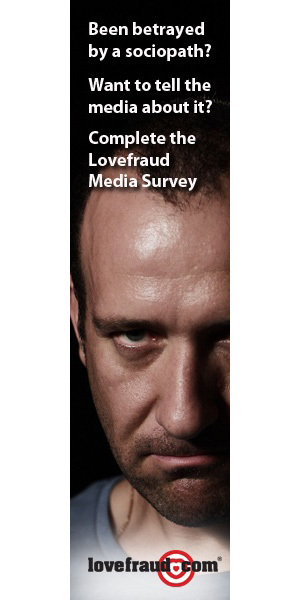 You may feel like the sociopath is hanging on your every word because he or she is crazy about you. The reality is that the sociopath is looking for the deepest places within you in which to set the hook. Hassan has been helping people escape cults for years. He’s developed a protocol for how to do it, which he describes in the book. He does not recommend forced deprogramming. He does recommend that the victim’s family and friends unite to help the person leave. In the book he also includes practical ideas for how to help someone who is stuck in a cult. Here’s what doesn’t work: Trying to argue the person out of the involvement using a condescending, confrontational approach. Notice that your objective should not be rescuing the person from the group. People leave destructive cults as a natural consequence of changing and growing. If people are focused on positive growth, there will be less resistance, and everyone’s efforts will be more effective. 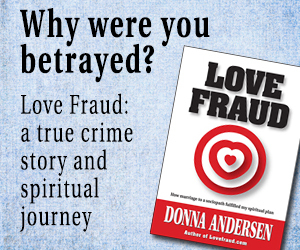 Many ex-cult members describe their experience with a cult as if they had fallen deeply in love, and given every ounce of their love, trust and commitment to someone, only to find out that the person was a false lover and was just using them. The pain and the sense of betrayal is enormous. That, of course, is the exact experience of a person who has joined a “cult of two” by falling in love with a sociopath. I strongly recommend this book. It’s important that we all know that dangerous cults are operating among us just as dangerous sociopaths live among us. Combating Cult Mind Control goes a long way towards explaining how people, perhaps including ourselves, come under the influence of sociopaths. It can also help us protect ourselves, our family and our friends. Combating Cult Mind Control is available on Amazon.com. THANK YOU Donna for not only reading this book but posting this article on Steven Hassan’s book. Just before I escaped my marriage I had friends over to decorate Christmas cookies. As I stood in my kitchen watching my friends laugh & chat away I thought to myself what happened to me? I use to laugh & have a happy life. As I sat there hating being married I had a light bulb moment literally that my then husband was brain washing me. I knew nothing of this subject…I had never read a book on the topic or watch any documentary on the subject. But right then and there I knew I needed to escape. And a few weeks later I did just that. I then got on the internet and searched how to undue brain washing. And over time my searching lead me to Steven Hassan’s site & his book. As I read his original book I found my answer that I had been desperately looking for with marriage counselor and throughout my marriage. Never did one of the marriage counselor ask me if my h was controlling during those sessions and yet Hassan’s book unraveled my entire marriage & how I was manipulated mentally from day one. The part that really stands out for me is that my emotions were limited compared to prior meeting my ex h. He like your post states Donna narrowed my emotions to just one or two but most of the time I felt like I was a walking Stepford robot zombie wife with zero emotions. So crazy this world we live in. Hassan’s book along with your books & site Donna saved my life. 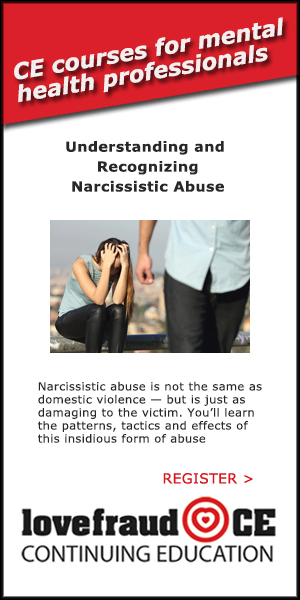 I would love to see you and Mr Hassan some how join forces and give a lecture at a National Domestic Abuse center conference for all the centers around the country to really open their eyes to the evil that victims truly endure. 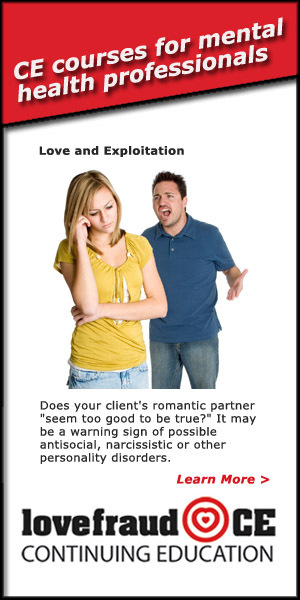 My local abuse center never guided me to the truth about my ex. 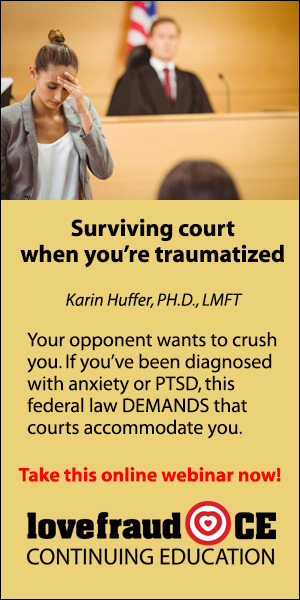 I personally feel that if these domestic abuse center gave victims the truth from day one and knew exactly how to help open the victims mind up from the brain washing with Steven Hassan’s techniques a high percentage of victims would end their abusive relationship that very day. As this is what I did that very day that the counselor told me who my ex was and that he was literally brain washing me. That was all I need to know that I needed to leave this very abusive man…no more pity play, brain washing, gas lighting could be done to control my mind by him. You both ARE making a positive difference in this world!! PS THIS Book is a MUST read book!!!!! Gaslight, here is Donna’s book review. Here is Steven Hassan’s interview on Dr Drew podcast for you to listen to if you want. Reenie47, PLEASE read this article and also purchase Stevens Book it will give you the tools to open your daughters mind up from the brain washing & mind control her husband has her under. You need to ask her questions vs talking to her. 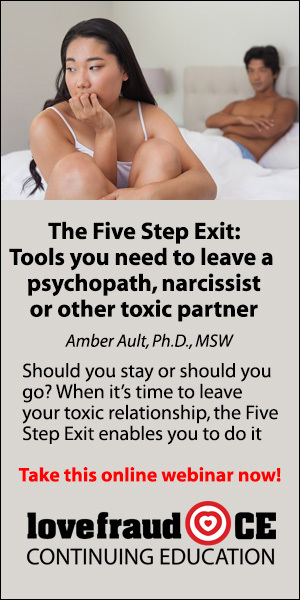 Questions plant seeds in her mind and if you plant enough questions she will start putting the bread crumbs together to get out of this abusive relationship. 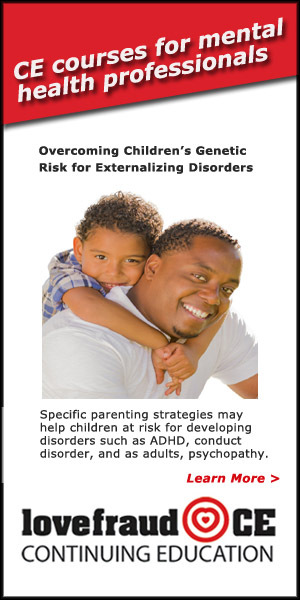 Also connect with your local abuse center to get their help for when your daughter does finally break her mind free from his control. In addition if you can find a counselor who is extremely knowledgeable with sociopathic abuse do it now with out your daughter knowing. Have every things set up for when she does walk out on him again. She needs her whole family to rally around her now without her knowing. View her husband as a Cult leader and your daughter as a cult follower!!! This will give you sense of what she is really dealing with. Steven Hassan’s website is Freedom of mind resource center. Google his name with the words “interview”, to watch his interviews on CNN, Fox, Larry King Live and most importantly The John Walsh show. ALso do a search here on LF up at the top right corner for “Mary Ann Glynn” she is an excellent counselor that Donna Anderson (LF site creator) has connected with. 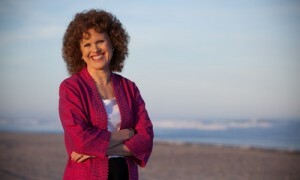 Mary Ann Glynn does free online group counseling sessions and you can also see her interviews with Donna (which are excellent!!) by doing a search and maybe they are posted under the “Video” tab at the top of LF. HELP your daughter out of this very mentally, emotionally, verbally & Physically abusive relationship!!! Glad that you had the courage to post here on LF!! !